Mathematical models are used to represent systems and answer various questions regarding the behaviours and outputs of systems. In complex systems elements and sub systems are connected in myriad ways. Elements and sub systems have nonlinear relationships through connectivity, creating interdependencies, where relations and behaviours co-evolve in continuous dynamic interaction over time. 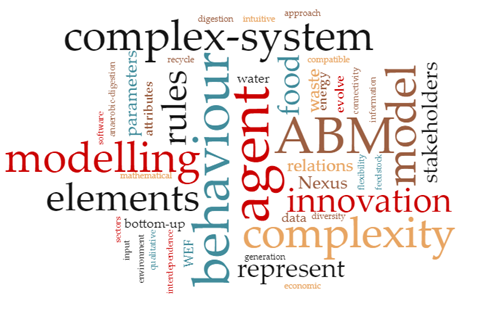 Modelling innovation diffusion within the Water Energy Food (WEF) Nexus requires complex system thinking because both innovation systems and the Nexus possess common characteristics of complex systems such as numerosity, connectivity, interdependence, heterogeneity and adaptation. Indeed modelling any innovation that has impact on water, energy and food sectors requires involvement of diverse stakeholders as well as consideration of processes within those sectors. In the case of AD innovation, for example, feedstock producers, farmers, AD plant operators, waste collection companies, and local authorities are some of the stakeholders involved within the WEF Nexus. Each of these stakeholders are related to each other at varying levels of interdependency and these relations are not static but evolve over time with changing economic, environmental, social and political circumstances. Each stakeholder behaves autonomously without any centralised coordination or decision making mechanism. Furthermore the elements in the innovation system are usually heterogeneous with high levels of diversity. In the case of AD innovation, feedstock sources can be residential households, restaurants, food producers, retail stores each having different food waste generation rate, recycle rate and different responses to the changing policies, economic and environmental indicators in their waste generation and recycling behaviours. Agent Based Models (ABM) are promoted for their promise to reveal the emerging behaviour of complex systems. Agent Based Modelling is a bottom up approach where the system is represented with agents and their behaviour rules. Therefore it is a natural candidate for modelling any complex system where the agents can represent elements of the system and the behaviour rules of the agents can represent the network defining the relationship between the elements in a very intuitive way. The agents and their behaviour rules can result in formation of sub systems within the systems. Emergence resulting from their behaviours can be detected depending on the sophistication of behaviour rules’ definitions. There is significant flexibility in defining the attributes and behaviour rules of the agents in such a model, particularly as both the attributes and the behaviour rules of the agents can adapt and evolve overtime. Eventually the evolving behaviour of the agents and the sub systems can reveal the behaviour of the innovation system within the Nexus. Besides having very high potential for revealing the behaviour of a complex system, there are several other merits of agent based modelling that makes it very useful tool for modelling a complex system. ABMs support heterogeneity in the elements of the system at the micro level, therefore any diversity within a complex system can easily be represented with an ABM. Uncertainty in the system can be modelled with randomly generated input parameters which can be based on population distribution data, and the ensemble average behaviour of the system can be calculated with Monte Carlo simulations. ABMs can be developed in spatial space by defining the location attributes of the agents. Most ABM software is compatible with Geographic Information Systems allowing geographic analysis and visualisation. Although ABMs dominantly run with quantitative input parameters and variables, incorporating qualitative information into a model is also easy and intuitive through behaviour rules. Actually some behaviour rules can only be defined by parameters that are not measurable with numbers, making qualitative descriptions inevitable. The bottom up nature of agent based modelling makes it highly compatible for structuring the model in a modular manner which enables easy expansion or revision of the model. Although ABM offers significant capabilities and flexibility in various aspects of modelling, there are some cons and risks of using ABM for modelling a complex system. A major con is that ABM development requires a lot of data and information, and the data requirement increases exponentially with the complexity of the system! Not only the input data but also the output results of the ABMs can be exhaustive and difficult to communicate. Other forms of modelling are more simplistic since they do not represent the complexity of the real system, so overcoming these ABM challenges must be faced. Since ABM is a bottom up approach any element of the system and connections between them that may have significance for the overall behaviour of the system have to be mapped and represented completely. These may not be fully knowable, due not only to informal systems operating in the Nexus but also to agents not behaving according to formal rules. Due to the unpredictable nonlinearity in the representation of the system, there is always a considerable risk of the model diverging from the behaviour of the actual system, resulting from inaccurate initial conditions, model parameters or incomplete mapping of the system. For the Stepping UP project, anaerobic digestion innovation was identified as the lead innovation for impact on the WEF Nexus and was investigated comprehensively due to availability of data, strong engagement and contribution of stakeholders and maturity of the innovation in the UK. The rationale for selecting AD as one of the innovations to investigate within the project is discussed in greater depth in a blog post by Iain Soutar. The complex system of AD innovation in the WEF Nexus starts with the emerging AD market that collects food waste which are fed into AD operations, generating biogas and digestate, and consuming water in the process. AD innovation diffusion and daily operations is modelled at both county and UK scales. The county scale ABM simulates Lincolnshire and is coupled with a decision support tool to investigate alternative patterns of AD diffusion resulting in different economic, environmental and social outcomes. The model assesses outcomes of policies which influence the distribution of size and the centralisation of AD plants. The UK scale model investigates the influence of three changing pathways to alternative 2050 scenarios on AD diffusion. The model quantifies the range of AD diffusion success. The most challenging part of developing the AD ABMs was to map the system completely and to acquire the data that will inform the model. Setting the behaviour rules properly and assigning precise values for the model input parameters require significant amount of high quality and relevant data. Although Anaerobic Digestion was one of the innovations in the Stepping UP Project with most data and support from the stakeholders, still it is hard to say that we were able to collect enough data and information to develop the AD ABMs at the desired level of details. Some of the data were simply not available, some data were not accessible by the project team because of confidentiality concerns, and part of the available data were collected for other purposes and not viable to feed into the model. Besides the challenges in the data acquisition both AD ABMs can be considered successful as they provide a tool to evaluate different decision alternatives or future scenarios relative to each other. As a result of the collective behaviour of source (agents’ creating food waste), collector (agents collecting food waste) and plant feasibility (AD operator) agents, new viable collection areas emerged in the model and some of the collection areas expire over time. Also, the emerging behaviour of the whole system is revealed in the spatial distribution of the plants and collection areas, distribution of the plant capacities as well as the saturation of AD in the whole area (county or nation). The developed AD ABMs demonstrate the self-organisation and emergence of sub systems within the system and revelation of the emergence behaviour of the whole system. Furthermore, the developed AD ABMs are meant to serve as a platform for all the project partners from various disciplines as well as the end users to communicate the elements and dynamics of this complex system from different complementary perspectives.